Chorley Ladies exited the SSE Women’s FA Cup at the second roundstage as they went down 3-0 at home to Leicester City. It was a tough draw for Chorley, as the Foxes are flying high in the league above. 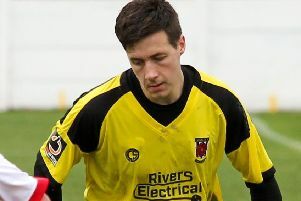 But nothing fazes Chorley, who have strong belief and are a tight-knit squad. The game started at a high tempo, with both sides opting to dribble at pace to try and cause the opposition problems. Chorley were switching the ball nicely, with Vicky Coope and Rachel Wood offering options wide. A few well-worked patterns of play between Maddy Cullin and Scarlett Smith resulted in a handful of corners, which Leicester just about managed to scramble clear. The Foxes did start to press after their slow start, but Megan Fisher and Saskia Bowes were communicating well to clear the danger. Last-ditch tackles by Janet Mitchell, Jen King and Bowes all prevented Leicester from taking the lead, and keeper Meghan Pope was in fine form, collecting any loose balls that rolled through. The breakthrough did come midway in the first half. A quick free-kick found Leicester’s Sophie Domingo in the box. Her shot was well saved by Pope, but Nat Johnson followed up and slotted home. Leicester had their tails up and continued to attack. Their second goal came in the 35th minute. A looped ball from deep was nodded in by Leah Cudone to extend Leicester’s advantage. Despite this, Chorley remained focused and continued to have a good shape and defend resolutely. Just before half-time a controversial penalty was awarded to the visitors as King fouled Domingo in the area – Cudone went on to have two strikes on goal from close range, both being saved brilliantly by Pope, only for the referee to bring back play for the penalty, which the visitors missed. Cudone did get her second of the game in the 53rd minute when Leicester overloaded the Chorley backline, and she passed the ball beyond Pope, who was unlucky as she got fingertips to the ball. Katherine Bonner came on for Smith at half-time and she made some superb tackles and made Chorley a very strong defensive unit but the game finished 3-0 to Leicester .